Sometimes you just want to get away from it all—to escape the din of a busy office, or the roar of a plane, and enjoy your favorite album or podcast. Or maybe you just want the world around you to be a little quieter so you can concentrate or relax. Noise-canceling headphones aim to provide just such an aural refuge. I looked at five models marketed as premium noise-canceling models to see if they live up to their hype (and price tags). Active noise reduction, on the other hand, aims to reduce the level of audible noise via technology. One or more microphones built into the headphones sample external noise, and the circuitry inside immediately pumps an inverse audio signal through the headphones (along with whatever audio you’re listening to). In theory, this inverse audio signal cancels out the external noise—thus the name of the technology. Most noise-canceling headphones therefore use a combination of passive and active noise reduction: large, sound-blocking earpads (or in-ear-canal earpieces), along with noise-canceling circuitry. Audio-Technica is a company long associated with professional audio products. I’ve used the company’s microphones for well over a decade, and the ATH-M30 closed headphones are required equipment for every student enrolled in the Recording Arts and Technology program at the college where I teach. The company’s $350 ATH-ANC9 QuietPoint Active Noise-cancelling Headphones (4 of 5 rating) is the higher-end sibling of the ATH-ANC7 and ATH-ANC7b noise-canceling models, both bang-for-the-buck standouts. A unique feature of the ATH-ANC9 is that it offers three modes of noise-canceling operation, each designed for a different listening environment. Mode 1 is meant for use when traveling in airplanes, trains, and buses, and it applies greater cancelation to low frequencies in order to reduce the rumble of engines, roads, or track noise. Mode 2 is intended for use in noisy offices or crowded environments, while Mode 3 aims to enhance already-quiet environments such as libraries. I found the ANC9’s noise-canceling circuitry to be very effective in my listening tests, and the different modes of operation worked as claimed. One issue—common among noise-canceling headphones—is that all three modes produce an audible hiss that’s annoying when not listening to audio. (The hiss was particularly bothersome to me in Mode 3.) However, the noise generated by the circuitry is much less of an issue when listening to music or spoken-word recordings. The ANC9’s sound quality is good for noise-canceling headphones, with frequency response that’s fairly well balanced. The ANC9 is also lightweight and comfortable, although the earcups are a bit smaller than I’d prefer, and they may apply too much pressure for people with large ears. Audio-Technica includes a variety of accessories, including a semi-rigid travel case and two detachable 1/8-inch (3.5mm) audio cables. One cable contains a built-in microphone and a single-button inline remote for controlling media playback and phone calls. The ATH-ANC9 is powered by a single AAA battery that’s easily swappable, but you can use the ANC9 without power—without the noise-canceling functionality, of course. The bad news is that the ANC9 sounds significantly different when unpowered: The midrange and upper frequencies are quite muffled, and the low frequencies lose focus. You’ll want to keep an extra AAA battery handy. 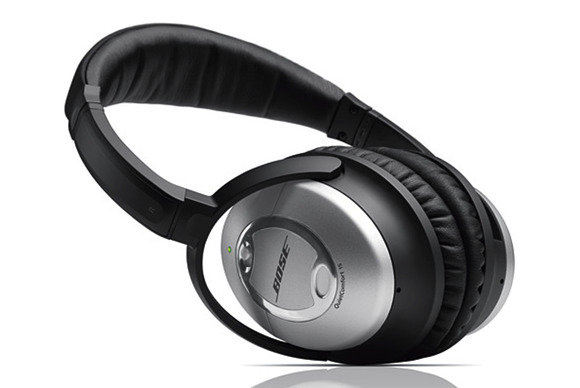 Bose has long been the most well-known maker of noise-canceling headphones, and the $300 QuietComfort 15 (4.5 of 5 rating), which I’ll refer to as the QC15, is the company’s flagship circumaural model. Unassuming is the best way I can describe the appearance of the QC15. The design and build quality is focused on keeping the headphones light and compact. As a result, the QC15 isn’t as stylish as some of the other models here, and it doesn’t feel quite as sturdy. That’s not to say the QC15 is flimsy, but I’d be less careless with it than with a few of the other models. The QC15’s ability to reduce external noise creates an almost disorienting experience—after putting the QC15 on, it was immediately obvious to me why Bose sells so many noise-canceling headphones. Even better, the overall sound quality is very good for a noise-canceling design, with no part of the frequency range significantly lacking or too prominent. The design of the QuietComfort 15 is focused on portability. Bose includes a cable with an Apple-style, three-button remote/mic module; the semi-hard travel case has the smallest footprint of all the models tested; and, like the ATH-ANC9, the QC15 requires just a single AAA battery for operation. However, if that battery dies, you can’t use the QC15 at all. Harman Kardon’s $300 NC (2.5 of 5 rating) features both a simple name and a minimalist design: If you’re a fan of Apple’s hardware, you’ll appreciate the look of the NC. Thin, metal trim surrounds rectangular black earcups, which are connected by a sleek metal headband. Harman Kardon provides two different sizes of headbands, so you can choose the one that better fits your head. The NC may be the best-looking model of the lot, but it’s definitely not the most portable or travel friendly. Whereas every other model covered here includes a zippered, rigid case, the NC includes only a flimsy travel pouch. And while this pouch may not protect the headphones much, it’s necessary to protect your other gear from the headphones: The metal frame around the earcups has a hard edge that could scratch your laptop or other items. Unfortunately, the NC’s sound quality disappoints. Midrange frequencies are overexaggerated, music sounds thin, and spoken-word audio is especially harsh and fatiguing. The noise-canceling performance is also average—it does reduce external noise, but the other models here are far more effective. The NC is powered by a nonremovable battery that you must recharge via USB—if the battery dies on a flight, you’re out of luck if you don’t have your laptop or a USB battery charger handy. The NC’s audio cable has an Apple-style, three-button inline remote for controlling playback and volume level, along with a microphone. The NC works with or without the noise-canceling circuitry enabled, and unlike with the Audio-Technica ATH-ANC9, the sound quality remains largely the same either way. Logitech’s $400 UE 9000 (3.5 of 5 rating) is the company’s top-of-the-line full-size headphone, and the sibling to the UE 4000 and UE 6000. The UE 9000 is the most expensive model in this roundup, but it’s also the most versatile: In addition to a (detachable) wired connection to your audio source, it also offers Bluetooth connectivity and active noise cancelation. The UE 9000 paired easily with my iPhone 5, and the play/pause and volume buttons, built into the right earpiece, worked well. These controls work only when paired via Bluetooth; for wired use, there’s an inline remote/microphone module on the audio cable. (The volume buttons on the wired remote work only with Macs and iOS devices.) An internal battery, charged via USB, powers the headphones; Logitech includes a USB cable and a USB charger. If the battery dies when you’re out and about, you can still use the UE 9000 as standard headphones. The UE 9000’s build quality is excellent, and though it’s a little heavy, it’s still quite comfortable. However, I found its noise-canceling circuitry to be only moderately effective and, as with its UE siblings, the sound quality isn’t well-balanced: High frequencies are dull, and bass response is muddy. Overall, the UE 9000 falls somewhere in the middle of the models I tested—better than some, but worse than others. Given the price, that’s a bit of a disappointment. Polk has long been associated with Hi-Fi and home-theater speakers, but a few years ago the company entered the headphone business. The $300 Ultra Focus 8000 (3 of 5 rating) is Polk’s top-of-the-line model, and it’s ruggedly built, with large earpieces, a thick headband, and earpads that contribute to a very comfortable fit. Though it connects to your audio source using a standard audio cable, the Ultra Focus 8000 features Bluetooth-style play/pause and volume buttons on the right earpiece (the volume buttons work only with Macs and iOS devices). A convenient push-to-hear button lets in ambient noise so you can temporarily hear external sounds and conversations. The 8000’s noise-canceling circuitry works reasonably well, but is not nearly as effective as that employed by the Audio-Technica and Bose models. Sound quality is good, but bass heavy. The Ultra Focus 8000 uses two AAA batteries, and it doesn’t work as a standard set of headphones when unpowered. Of the models I tested, Bose’s QuietComfort 15 reigns supreme in noise-canceling performance and sound quality. I rank the Audio-Technica ATH-ANC9 second overall, though I really like the multiple cancelation modes and the ANC9’s ability to function without battery power—features that might make it a better choice depending on your uses. Logitech’s UE 9000 is appealing if you’re interested in Bluetooth capability when off the plane, though you’ll sacrifice audio and noise-canceling performance. The Ultra Focus 8000 offers decent noise-canceling performance, along with good-but-bass-heavy sound quality. Though it doesn’t offer the best audio and noise-canceling performance on the market, Logitech’s UE 9000 is comfortable and versatile, offering both wired and wireless (Bluetooth) connectivity. It’s noise-canceling circuitry is moderately effective, and its audio quality emphasizes the low end. The NC looks great, but it’s not very travel-friendly, its noise-canceling performance is only average, and its overall sound quality disappoints. Among the noise-canceling headphones we've tested, Bose’s QuietComfort 15 reigns supreme in terms of noise-canceling performance and comfort, and it also offers good sound quality. The ATH-ANC9's multiple noise-cancelation modes and capability to function without battery power make it a versatile performer, and it also sounds very good.